Everyman Theatre has opened a fine production of a modern classic at the Courtyard. The story of a group of impoverished friends struggling to make their name in New York under the shadow of HIV/AIDS, Rent is among the longest-running Broadway musicals, having been performed at the Nederlander Theatre from 1996 to 2008. Its historical significance (both social and theatrical) is great, and it is starting to show its age, with a few obscure lines now highlighting the changes that have come about in western society’s responses to HIV/AIDS and homosexuality in the last decade. It remains, however, a very poignant story, highly developed in character and plot; qualities that are extremely rare in musical theatre. Unfortunately, blaming the lack of decent Canberra theatre venues isn’t entirely going to wash. The two frequent alternatives used for musicals, The ANU arts centre and the Erindale theatre, are both, as far as I can tell, not being used for anything at the moment – either could have been used. Squeezing a show that is too big for the venue into a space that cannot cope acoustically (and it’s not like Everyman were unaware of the nature of the venue, they’ve performed in the Courtyard studio several times now – and West was completely aware of the nature of “Rent”, he’s directed it in WA) is a mistake. I like the work Everyman does, and … I haven’t actually seen the show yet, so I’m posting in the dark a little. But just because they’re smart capable theatre practicioners does not mean that they’re immune to criticism for making elementary site booking mistakes. Yes, see; that’s why I wouldn’t accept Erindale as a better venue; it’s too cavernous. Where did you sit? I may have chosen a bad seat, right up the front at stage left. I hope they’ve recalibrated, because the performances really deserved better. 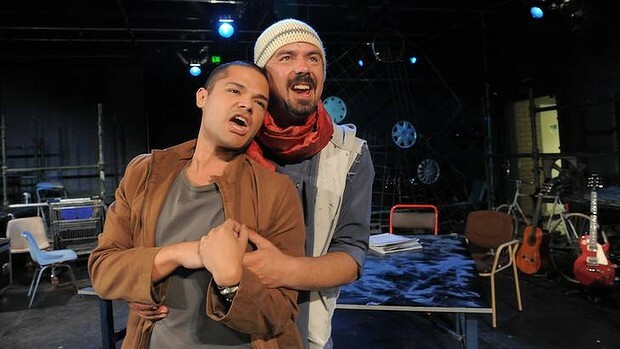 Aaand review posted (ridiculously long and highly personalised and written by someone who should probably have gone to bed earlier – http://cantheatrewatcher.blogspot.com.au/2012/12/rent-everyman-theatre.html). I was sitting a row back on one of the aisles, on the left side block of the audience. I may have been a little generous, but really I didn’t want to be too hard on the production as a whole when the performances are of such a high calibre. And anyway, I think Erindale is as much too big as the Courtyard is too small. The fantastic characters in Rent shouldn’t require a set of binoculars. Which evil is the lesser of the two? The ANU Arts Centre is a write-off since its refurb in my opinion; its auditorium has so little legroom that I don’t think it should be used for anything where a fully grown adult male might be expected to sit for longer than ten minutes (I’m a little on the tall side, but I’m not far above the average for my race; I hardly think auditoria rows should be designed specifically to exclude half the adult male population as this one has been (and, yes, it makes me angry))! The new performing arts centre at Canberra College may have been an alternative, but it wasn’t finished when rehearsals would have started for this, and they couldn’t have been sure then that it would be finished on time. So while I think the Courtyard is definitely the wrong venue, I’m not so sure that better venues were practical in Canberra. Another alternative I’ve just thought of may have been the Belconnen Theatre, which my gut tells me is slightly larger in both floorspace and ceiling height than the Courtyard. I suspect both it and Erindale were rejected because they’re suburban. Sorry, I’m getting the nomenclature mixed up; I didn’t mean the Belconnen Theatre in the community centre, I meant the Dance Studio at the Belconnen Arts Centre.